The unusual element in Strajk is that there is only one piece on the board (which represents Lech Wałęsa). 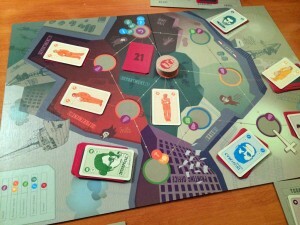 On their turn, a player can use walking/running cards to move Lech Wałęsa to different locations around the docks. Most locations have one type of cards next to them and, when Lech Wałęsa is at a location, a player can gain a card there if they play the required mix of cards from their hand. For example, to gain a correspondent (green) card, a player must play a worker (orange) and a resident (yellow) card. There is a simple hierarchy to the cards so you know which colours you need in order to gain to get better cards and ultimately exchange them for ‘Demand’ cards (which represent the 21 demands made of the government by the workers). A player wins as soon as they obtain 2 Demand cards. Whilst the hierarchy of the cards is simple, you need to plan what cards you want. Gaining better cards is essential as it makes it easier to obtain the next cards after that but you need to balance what you put in your deck – too few cards of one type and you’ll struggle to gain better cards, but too many and you’ll find these clogging your deck later diluting the cards you really need. Whilst you may have a good plan, the cards you have in your hand each turn (and the position of Lech Wałęsa) will determine what you can achieve too so you always need to think quickly how you can best use your hand to achieve your plan, or find a different plan that you can achieve. Sometimes it’s better to not gain less-useful cards just because you can. Each type of card can also be used for its special power such as draw 2 extra cards, discard a card from your hand out of play (which allows you to remove cards that are now in the way and making it difficult to get the cards you really want in your deck in your hand at the same time). Like other deck-building games, balancing what special actions you have in your deck is an important tactical decision as is when to use these special actions. As there are few card types, there aren’t many different special actions. All cards are limited in number so you need to watch what other players have taken in case you find yourself without enough of one type. This also means you can try to deny other players too (although you must try to reign in the want to hinder an opponent if having those cards will hinder you more). As all players move the same piece on the board, players try to leave it in the most awkward position possible for the next player. This adds some humorous screwage to the game which is made even funnier because there’s no direct way a player can repay the ‘favour’ (unless it’s a 2-player game). So, players usually take out their annoyance by doing it to the next player, and so the cycle of annoyance continues. The theme is certainly unusual and I like that it is informative too. Each location represents one of the real-world places, like the printing office where the foreign correspondents (cards) are located, and the underlying messages makes sense such as using speeches to gain workers support; however, this is fairly subtle unless you read the descriptions in the rules. The deck-building game mechanic works well as a game but I wasn’t convinced it was an obvious fit for the subject matter (unlike Kolejka whose game mechanics really explain queuing for sparse goods). That said, what game mechanic would fit workers’ strikes led by one man without being a complicated simulation game? (It reminds me of a job when I was asked to create a card game that explained how plant sterols reduce cholesterol – yes, really.) So, whilst deck-building may not obviously represent/explain Lech Wałęsa’s actions, it works well to make it an accessible game with interesting decision-making (which is much more important because a game that plays well is more important than a game that is accurately representative. The artwork looks good with a retro theme that fits the era and place, as well as using clear icons. Setting the game board at the docks with the different locations connects the game to the real-world and really reduces the abstract nature of the network of spaces and pathways. Overall, I enjoyed Strajk as it is unusual and is a simple, short and fast deck-building game which feels different to anything else. There are the usual deck-building decisions to be made so you must constantly be thinking on your feet to react to the cards in your hand and position on the board when it is your turn. You can plan ahead when it’s not your turn and can see what cards you have in hand, but this is likely to need adapting to the situation so you should think of alternative options too. The constant activity, the humourous annoying the next player and lots of small decisions to make gives an air of anticipation and involvement. If you start to fall behind, it can be hard to catch up, plus there is some luck in the draw of your cards (but you need to control this by using special actions to remove the chaff and by keeping cards in your hand for your next turn). As with most simple games, it means there’s probably not a massive amount of variety in replay but that is acceptable as the outcomes and decisions you need to make will be different. The deck-building game mechanic has been included in some unusual and inventive places over the last year where it has worked well, such as Freidmann Friese’s humorous electioneering game Copycat, and AEG’s railway line building game Trains. It has also found a good home here in the Polish strikes of the 1980’s (and that’s a sentence you don’t get to write very often). You can read the rules and see the details of the game on the publisher’s web site (bga.me/strajk) and I am looking forward to the Karol Madaj’s next game, Reglamentacja, which is about swapping food ration cards. This entry was posted on Tuesday, April 15th, 2014 at 3:33 pm	and is filed under Board Game Review, Board Games, Essen Spiel 13, Kolejka (Queue), Reglamentacja, Spiel 2013, Strajk (Strike). You can follow any responses to this entry through the RSS 2.0 feed. You can leave a response, or trackback from your own site.